Introduction: Topical corticosteroids are widely misused and uncontrolled use of topical corticosteroids leads to undesirable adverse effects on facial skin. 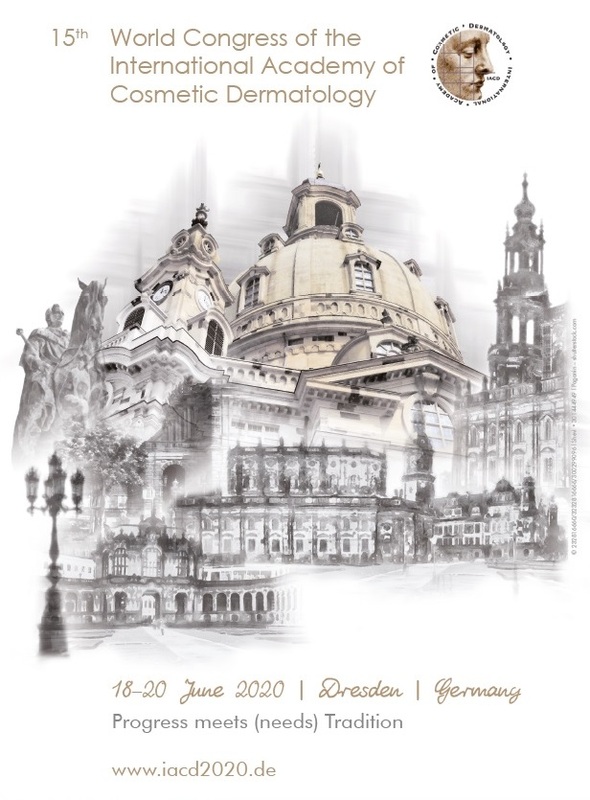 Aim: The aim of this study was to assess cutaneous manifestations of topical corcticosteroid abuse on the face and to analyse various factors contributing to the same. Materials and methods: A total of 100 patients with facial dermatoses using topical corticosteroids for a minimum period of 1 month attending the outpatient department from a period of January 2013 to September 2014 were enrolled for the study. Details about the usage of topical corticosteroids and their adverse effects were recorded. Results: Majority of the patients were females (68%). The most common indication for use was acne (68%), followed by melasma (22%). Most of the patients used them for duration of less than 6 months and most commonly misused steroids were of potent type. The commonest side effect was acneiform eruption (56%) followed by steroid dependent facies (26%). Other adverse effects like hypertrichosis, telangiectasia and premature aged appearance was seen with longer duration of steroid use. Conclusion: Misuse of topical corticosteroids is rampant and urgent, quick steps are required to increase the awareness and for better management of its adverse consequences. 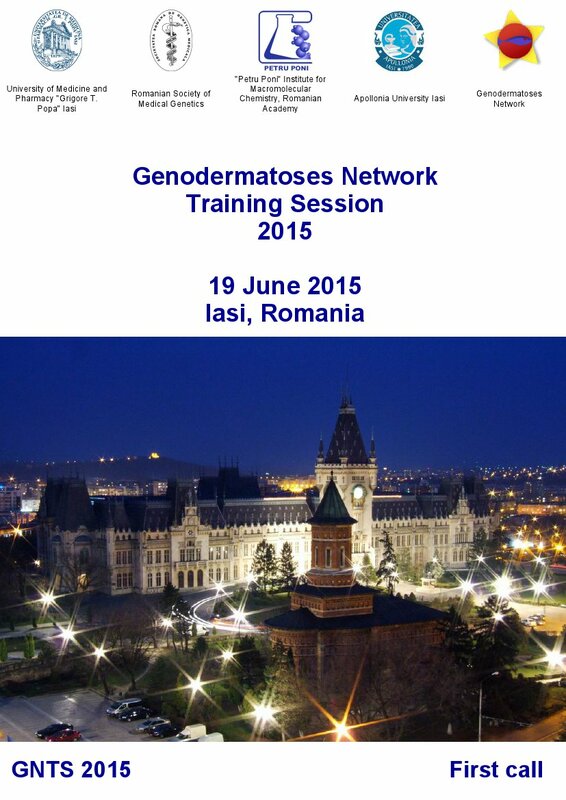 Key words: steroid abuse, acneiform eruptions, steroid dependent facies. Topical corticosteroids (TCS) are perhaps the most widely used agents amongst the therapeutic armamentarium and have been rightly acknowledged as a wonder drug in dermatological therapy . They provide immediate subjective and objective relief in symptoms in almost all inflammatory dermatoses thus justifying its rampant use. This usefulness of the drug has become a double edged weapon and made alarming proportion of individuals vulnerable to its abuse leading to serious local adverse effects especially on face . Vast sections of society have become victims of this magic drug owing to the craze of beautification leading to a virtual epidemic of acneform eruptions, steroid rosacea/steroid dependent facies, telangiectasia, hypertrichosis and premature aged appearance of face. Aim of our study is to make awareness about misuse of TCS on face and to give brief account of treatment modalities for the same. A total of 100 cases attending the dermatology OPD of GGS Medical College and Hospital from January 2013 to September 2014 were enrolled for the study after taking informed consent. Ethical clearance from the ethical and review committee was taken. Inclusion criteria for patients were the history of use of any TCS on face for duration of more than one month for cosmetic reasons including melasma, acne and non-specific reasons. Patients with history of rosacea, atopic dermatitis, seborrheic dermatitis and contact dermatitis prior to initiation of use of TCS were excluded from the study. A proper history was taken from patients regarding the duration of use of TCS; type and potency of TCS used; indication for use; source of prescription and symptoms like pruritus, burning, dryness, photosensitivity and rebound phenomenon. Thorough local cutaneous examination was done including Fitzpatrick skin type (I-VI), site, erythema, scaling, xerosis, telangiectasia, dyspigmentation, atrophy, wrinkling, papules, pustules, nodules and hypertrichosis. The general physical and systemic examination was carried out. Routine laboratory investigations and specific investigations were carried out where indicated and medical photographic documentation was done in all patients. Patients were instructed to avoid provocative factors (hot beverages, alcohol, spicy food, cosmetic), sun exposure and all the OTC preparations. Treatment options tried according the cutaneous adverse effect and severity were cold saline compresses, bland emollients, physical sunscreens, soap free cleansers, topical calcineurin inhibitors, oral antibiotics like tetracyclines, minocycline and doxycline, oral macrolides, non-cardioselective β-blockers like propranolol and oral vitamin C preparations. Amongst the 100 patients studied, 68 were females and 32 were males (M: F =1:2.125). Majority of the patients belonged to the age group of 26-35 years (Table 1). 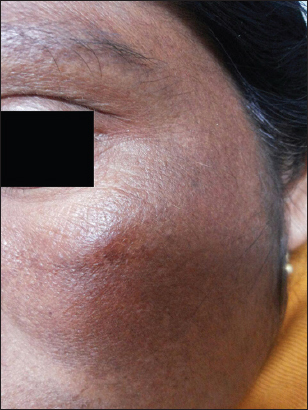 Duration of application was less than 6 months in majority, maximum duration being 6 years for melasma in a female. Steroids of different potencies as used by the patients are shown in Table 2. TCS for facial use were prescribed by peers (friends, relatives, beauticians) in 51, chemists in 22, physicians/general practitioners in 23 and by dermatologists in 4. Various indications for which TCS were used are elaborated in Table 3. The adverse effect profile of TCS is shown in Table 4 and Figs. 1–4. We did not observe allergic contact dermatitis to TCS in any of our patients. 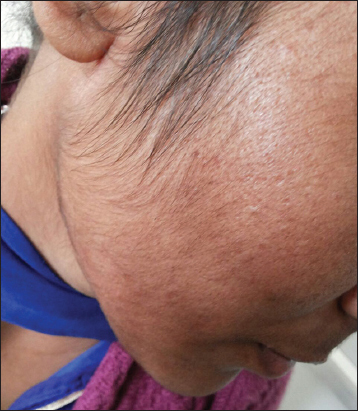 Amongst the adverse effects hypertrichosis, telangiectasia and premature aged appearance were seen with longer duration of steroid use (>6 months) and with potent steroid use. Majority of the patients with steroid dependent facies gave typical history of flaring of erythema on discontinuation of TCS. Patients with severe symptoms and steroid dependent facies who were given oral azithromycin 500 mg in the form of weekly pulse therapy (3 tablets per week for 8 weeks) or oral doxycycline/minocycline 100mg once daily for 8 weeks along with β blocker (propranolol 10mg twice a day) and oral vitamin C preparations showed good improvement after 8 weeks. Those with mild symptoms and acneiform eruptions were given topical tacrolimus (0.03%) for 8 weeks and showed good response in 6 weeks. 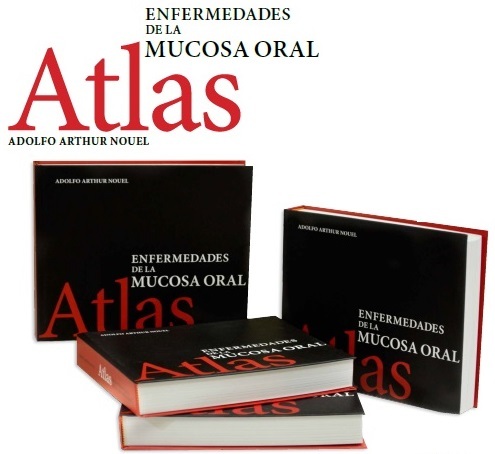 Avoidance of provocative factors, soap free cleansers, physical blockers and emollients were adjuncts to the primary treatment modalities and helped in ameliorating symptoms. The development of TCS in 1950s opened new doors for treatment of intractable dermatoses. In 1970s with introduction of higher potency TCS, new dermatoses related to over application of TCS begin to emerge. The first case of rosacea like dermatitis as a result of abuse of TCS was reported in 1957 . Face is the most common site for TCS abuse owing to rapidity of action and cosmetically appreciable effects. Various terms coined for lesions of steroid abuse are steroid rosacea , steroid dermatitis resembling rosacea , red face syndrome  and steroid dependent facies (SDF). It was observed in 26 patients in our study. The primary lesion in SDF is pinpoint, red or flesh colored papules or pustules. Eventually, patients develop persistent and diffuse erythematous and edematous skin with numerous telangiectatic vessels as well as deep follicular papules, pustules, and firm nodules [6,7]. 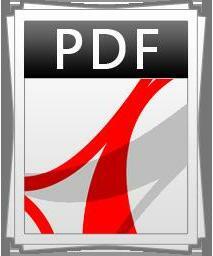 The pathogenesis of SDF and its rebound phenomenon is multifactorial. Steroids inhibit the release of endothelium derived relaxing factor. When steroids are withdrawn, the vasoconstrictive effect ceases and blood vessels enlarge leading to erythema, burning and pruritus . The immunosuppressive effect of TCS may facilitate the overgrowth of various bacteria, yeast, demodex mites or other microorganisms, resulting in inflammatory reaction that leads to papules and pustules . Acneiform eruptions are also the common side effect observed with use of TCS and was seen in 56 patients in our study. Bhat Y et al observed SDF more than acneiform eruptions in his study . It was interesting to observe that majority of our patients used TCS for various forms of inflammatory acne. Initially majority of the patients experienced relief but on prolonged use developed monomorphic, pigmented papular or nodular lesions. Other adverse effects observed in our study were telangiectasia, hypo/hyper-pigmentation, hypertrichosis and premature aged appearance as a result of atrophy and wrinkling. They were observed less commonly as in other studies. None of our patients reported allergic dermatitis to TCS or peri-oral dermatitis. Most of the allergic reactions reported due to use of TCS have been attributed to the base . Our study showed a good response to the combination of oral antibiotics (azithromycin and tetracycline group) and propranolol in severe cases and topical tacrolimus 0.03% in mild cases. Oral antibiotics were used in subantimicrobial doses owing to their anti-inflammatory properties . Beta-blockers antagonize the flushing reaction and hence were used in severe cases. Tacrolimus exerts its immunosuppressive and anti-inflammatory effects by blocking T cell activation. However in contrast to TCS it does not induce vasoconstriction and dermal atrophy . Thus as indicated by data in our study, the problem of TCS is already rampant in all parts of our country. With increasing magnitude of problem, quick and urgent steps are required to increase the awareness and for its management. 1. Hughes J, Rustin M, CorticosteroidsClin Dermatol 1997; 15: 715-21. 2. Rathi S, Abuse of topical steroid as cosmetic cream: A social background of steroid dermatitisIndian J Dermatol 2006; 51: 154-5. 3. Frumess GM, Lewis HM, Light-sensitive seborrheidAMA Arch Dermatol 1957; 75: 245-8. 4. Leyden JJ, Thew M, Kligman AM, Steroid rosaceaArch Dermatol 1974; 110: 619-22. 5. Zmegac ZJ, Zmegac Z, So-called perioral dermatitis [in Croatian]Lijec Vjesn 1976; 98: 629-38. 6. 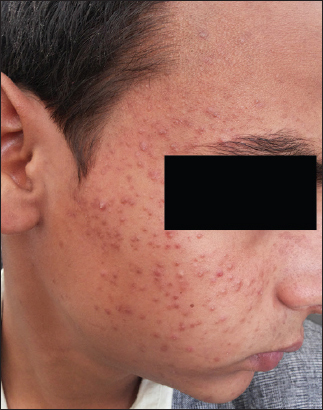 Ljubojeviae S, Basta-Juzbasiae A, Lipozenèiae J, Steroid dermatitis resembling rosacea: aetiopathogenesis and treatmentJ Eur Acad Dermatol Venereol 2002; 16: 121-6. 7. Kligman AM, Leyden JJ, Adverse effects of fluorinated steroids applied to the faceJAMA 1974; 229: 60-2. 8. Goldman D, Tacrolimus ointment for the treatment of steroid-induced rosacea: a preliminary reportJ Am Acad Dermatol 2001; 44: 995-8. 9. Pabby A, An KP, Laws RA, Combination therapy of tetracycline and tacrolimus resulting in rapid resolution of steroid-induced periocular rosaceaCutis 2003; 72: 141-2. 10. 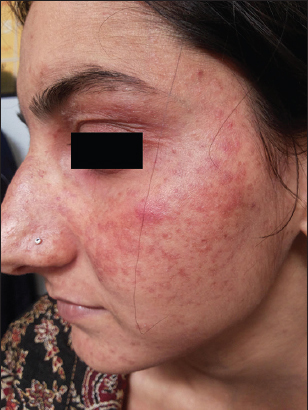 Bhat YJ, Manzoor S, Qayoom S, Steroid-induced rosacea: a clinical study of 200 patientsIndian J Dermatol 2011; 56: 30-2. 11. Beltrani VS, Barsanti FA, Bielory L, Effect of glucocorticosteroids on the skin and eyeImmunol Allergy Clin North Am 2005; 25: 557-80. 12. Vati RR, Ali F, Teuber S, Chanc C, Gershwin ME, Hypersenstivity Reactions to CorticosteroidsClin Rev Allergy Immunol 2014; 47: 26-37. 13. Liu ZH, Du XH, Quality of life in patients with steroid dermatitis before and after treatmentJ Eur Acad Dermatol Venereol 2008; 22: 663-9.